A new solar panel mounting system by Pinpoint Solar could drastically reduce the cost of installing solar panels in much of the developing world. Not only does the technology minimize material costs with their novel use of sheet metal, but the company is partnering with solar companies in Africa and island nations to manufacture the systems locally from anodized aluminum sheet metal. With minimal training, Pinpoint Solar says they can equip and train local solar companies to manufacture them in house. This means less overhead, reduced import taxes, a more reliable supply chain, and most importantly, a significant price drop. Countries with heavy import taxes or constrained supply chains could see the the overall cost of solar panel mounting systems fall by up to 75%, a figure that Dream Line Energy in Tanzania has called very possible due to the difficulty and cost of importing solar products there. The parts that can’t be assembled locally, such as the extruded aluminum adapters and investment cast clamps are supplied by Pinpoint Solar’s supply chain. Pinpoint Solar is a subsidiary of solar research and development company Sisyan LLC, who has R&D and pilot facilities in Baja California, Mexico. In addition to solar panel mounting systems, the company operates in the fields of solar desalination and solar PV domestic water heating. 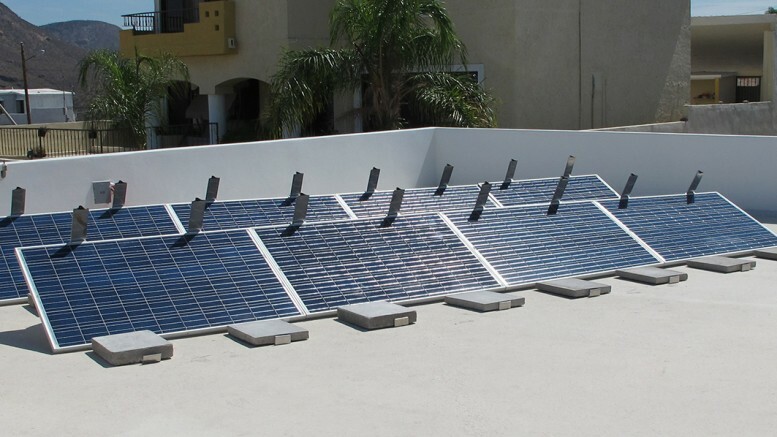 This ballasted solar racking system comes in two versions: fixed tilt and adjustable tilt. The solar panel racks are assembled from brackets formed out of anodized aluminum sheet metal, extruded aluminum adapters, and investment cast SS 304 clamps. Total rack hardware (excluding ballast) weighs about 3.5 kg. Ballast weight is 4×27 kg. The time needed to mount one PV panel is 0.12 to 0.6 man-hour. The time required to tilt one PV panel in preparation for a storm/hurricane is about 2-3 minutes. Be the first to comment on "New Solar Panel Mount Could Be Gamechanger for Rural Electrification and Island Communities"